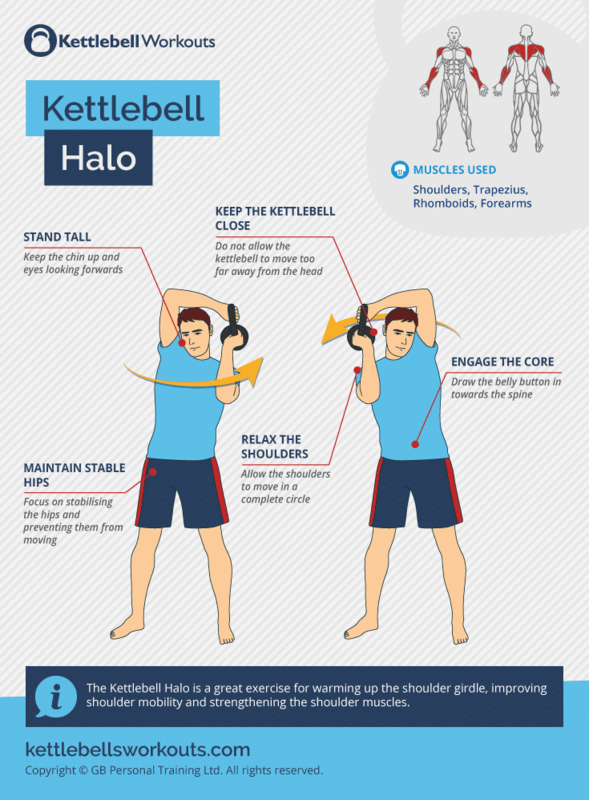 The Kettlebell Halo is a great warm up exercise for the shoulder girdle. You can use the Kettlebell Halo as a simple warm up exercise before starting your kettlebell workout or as an active recovery movement in between exercises. Keep the elbows tucked in and nice and close to the body all the way around the head. Ensure that the kettlebell stays as close to the base of the neck as possible. The closer you can keep the kettlebell to your neck the more you will work on improving your shoulder mobility. The first option is to hold the kettlebell by the ball, or body of the Kettlebell and then turn the kettlebell over at the back of the neck. The second option is to hold the kettlebell upside down by the horns, the same holding position as used in a Goblet Squat. Again the Kettlebell should be turned 180 degrees at the back of the neck. You can choose to either perform one direction for a set time or number of repetitions before changing direction, this creates a better flow, or change direction after every rep.